← Pearl Bakery: Eat Bread. Build Relationships. Be Sustainable. If you poke around on the Real Time Farms website and peruse recent adventures of the Real Time Farms Food Warriors, you’re bound to see some recent attention on goats. This is no accident. As the Food Warriors explore farmers markets, we’re coming across some great goat cheese vendors, and as I’ve learned, goats are not a fad here in the United States. In fact, they may be the answer to food allergies, as well as the solution to disappearing dairy farms across the country. Dairy cows are embedded deep in United States history, with European immigrants bringing cattle into the country for home and local use for dairy products and meat. Today in the United States cow dairy products trump those of any other milk-producing animal. Around the world, however, goat milk and goat products have been recorded to have been around the world since ancient times. Goats were depicted as a revered animal in Ancient Egypt, and were one of the first animals man has domesticated; goat herding estimated to have evolved in Iran some 10,000 years ago. Goats continue to be the leading milk producers around the world, though people do also raise and consume milk from sheep, yaks, water buffalo, horses, reindeer, and even camels. With the growing concern and discovery of food allergies and lactose intolerance, with cow’s milk being amongst the top origins for allergic reactions, people are turning to other kinds of milk. Goat’s milk for some people may be the solution. Goat milk may be more digestible than cow’s milk in part due to the composition of its fat molecules; those found in goat milk are smaller than those found in cow milk. Fat found in goat milk, in fact, is small enough where goat milk surpasses the need to be homogenized, the process of forcibly breaking fat globules by mechanical means. The protein found in goat milk, which forms softer clumps in the stomach than that found in cow milk, also makes it easier on the digestion system and less allergenic. The nutrition profile of goat milk is similar to that of cow milk, and is even more similar to human milk. Although cow milk is the most popular milk of choice in the United States, dairy farms have been on a steady decline in the country. This is due to large dairy corporations manipulating the pricing of milk; small farmers are not even earning the cost back of what they produce in addition to increased labor costs. While mega-dairy industrial factories grow in number and production, smaller farms with a smaller number of cows are dying out. With a mortgage to pay, a family to raise, and a beloved career at stake, what’s a farmer to do? For Jim and Donna Pacheco of Petaluma, California, this meant thinking both realistically and creatively. They needed to sustain 230 acres of lush Sonoma County land—their source of income and family’s home. “With this ranch we really couldn’t sustain having 600 cows. It’s definitely one of those things, you do what you need to do, and can do, to make the payments,” Donna Pacheco says. 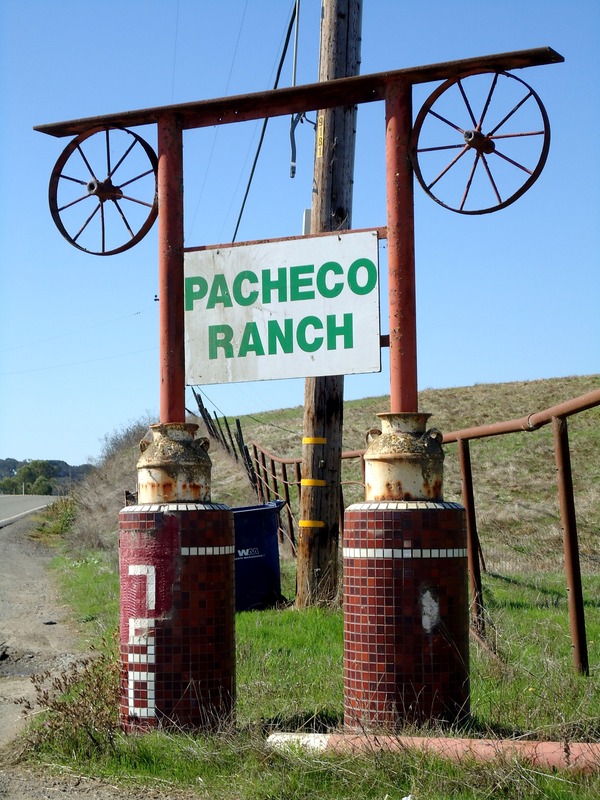 The Pachecos transitioned their dairy cow farm into a goat farm in 1997 and created the Achadinha (pronounced “osh-a-deen-a”) Cheese Company in 2004. Goat cheese is more popular amongst consumers than goat milk; goat cheese companies are often the route of small goat farmers. 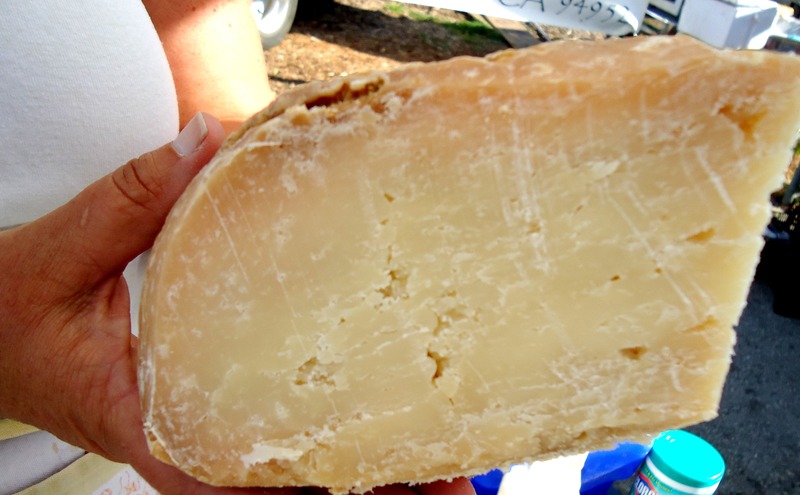 Today Achadinha cheese is on shelves in Sonoma County stores, in addition to being a presence at 40 farmer’s markets a week, where they see their biggest return on investment. 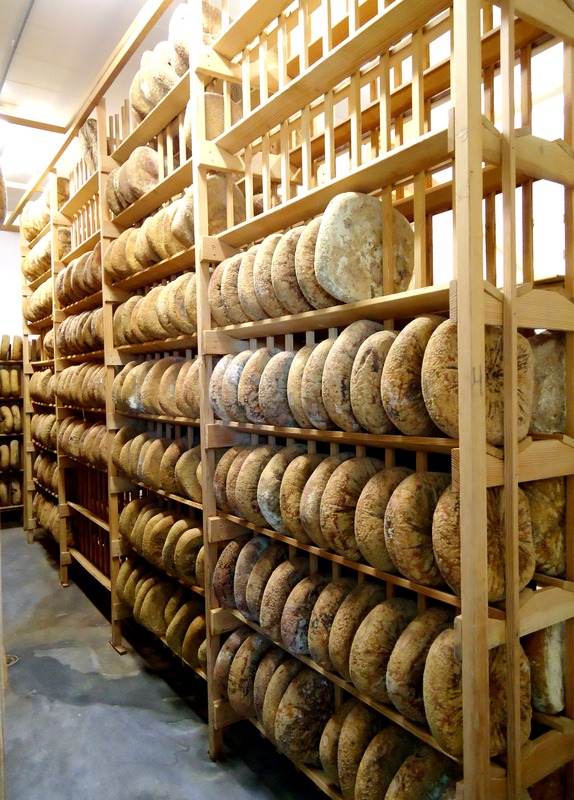 While the Pachecos have been making cheese for years, it wasn’t until 2010 that they built their own cheese making facilities on their own ranch, just steps from the family home, and was able to milk, process, age, and package their cheese all in one location, thus making it a farmstead cheese. The Pacheco’s cheese-making process involves Donna, Jim, and all their four children, in addition to a couple of employees. The cheese is handled with minimal machinery, from milking to squishing the huge balls of curd of whey,the process is largely done by hand. The cheeses are pressed into wheels that weigh in from 15-18 pounds and aged at a controlled temperature between 50 and 50 degrees. The Pachecos produce 3 types of cheeses: the Portuguese-inspired Broncha, their fresh Feta, which is cured in a sea salt brine, and their award-winning Capricious cheese. Though the cheese company is relatively young, their Capricious cheese has earned quite the reputation, named “Best in Show” by the American Cheese Society in 2002 and named one of Saveur Magazine’s “50 Favorite Cheeses in the United States” in 2005. Just outside the cheese-making facility are the Achadinha goats, all 600 of them. The Pachecos have all 6 traditional goat breeds: Toggenburg, Alpine, La Mancha, Oberhasli, Saanen, and the Nubian, which produces milk with the highest butterfat percentage of the breeds. Dairy goats are seasonal breeders, breeding in the late summer (when it gets cooler) through early winter. They do not mate in the hot summer. 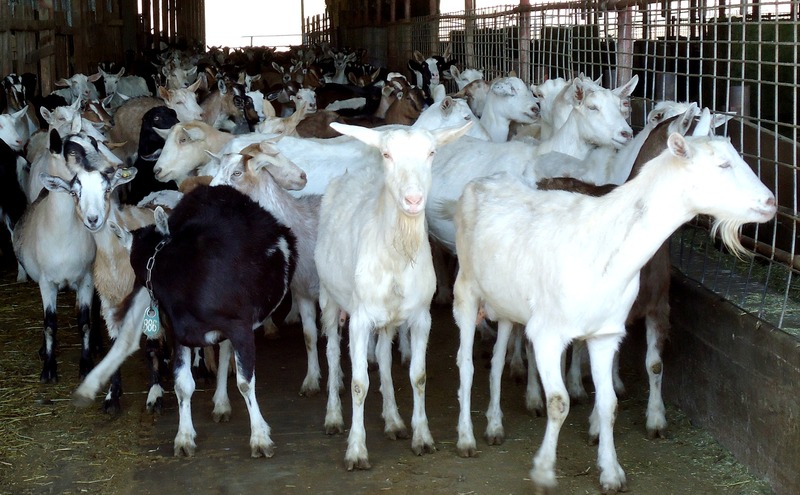 The gestation period is five months, and during the winter months, the most dairy goat farms don’t sell goat milk, often depending on cheese sales until spring season. The Pachecos must keep an eye on males and females during breeding seasons. The does must be kept in a separate pen when pregnant to ensure a healthy pregnancy, and the males will breed themselves to death, even forgoing eating, if not given extra attention to. “We don’t use hormones. So we are based on their seasons”, Donna stresses the schedule of their goats affecting cheese quality as we tour the farm. “You’re messing with your bodies by doing that.” Donna says, overlooking her (goat) kids. She wasn’t talking about her animals, either. The Pachecos are big supporters of naturally grown food, and wholeheartedly believe that you eat what your meal ate. The entire farm lives this philosophy, as is evident by what the animals eat. In addition to goats, the Pacheco Dairy also has four Australian Sheperds, a handful of Jersey and Holstein cows, chickens, and pigs. They all enjoy nibbling and sipping on leftover goat milk as well as day old Acme bread from nearby San Francisco and cheese rinds left over from the cheese-making process. The Achadinha goats are also treated to brewer’s grain, which Jim gets at three different local breweries. Not only is a source of protein and vitamins, but the goats absolutely love it! The goats are not fed corn or cottonseed, and are able to pasture feed year-round. As with everything else with the farm, everything has a place and purpose, even the goat’s waste! The Pacheco’s rent out a spot on their land for a composter who takes the goats’ waste, and with the help of Mother Nature and some heavy machinery, is able to produce an all natural compost, which he uses for landscaping jobs. The Pachecos also sell their milk to other dairy farms and cheese companies, rent out pasture to neighboring farmers (a common practice amongst farmers), as well as space for a small business, and living quarters for tenants. The name Achadinha is actually a nod to Jim’s Portuguese roots. Achadinha is a small, remote coastal village in Portugal. The land is lush and green, and is extremely fertile with volcanic nutrients, which makes it no surprise that the town’s main industry is agriculture. It’s no accident either, that Jim’s father first established the Pacheco Dairy in Bodega Bay in 1955, then to Petaluma in 1969. Though in comparison Petaluma is 40 minutes inland, both areas are known for its abundant natural resources. As a third generation farmer, Jim is determined to keep the tradition up. He has held on tightly, and as he teaches the practice to his children, the roots of the Pacheco family plant deeper into those 230 acres. Though times have changed the Pacheco Ranch is able to adapt and thrive, with the unexpected help of the goat. This entry was posted in Food Warrior Interns, On the Farm and tagged Achadinha cheese company, charlotte simpliciano, goat milk, goats, Pacheco Dairy, Pacheco Ranch, Real Time Farms. Bookmark the permalink.